Here is my first post in a long time… the truth is, I have been writing on such disparate projects of late (the male gaze on ancient Greek vases; the impact of the classical world on editorial cartoons [more]; ancient pathologies on Roman terracotta figurines [more]; the origin of signatures on ancient artworks, etc.) that I couldn’t bring myself to discuss the wild strands of research involved in writing the next volumes of Mina’s adventures. Then again, I’ve often cleared my mind and clarified my thoughts simply by voicing them out loud, usually in someone’s company… I leave the lonely experience of the gueuloir to Gustave Flaubert and his (wonderful) obsession with the perfectly attuned word. I tend to go out for a coffee with a friend and describe, viva voce my metastatic bundle of ideas. It often helps. But, ultimately, writing is a solitary and confined work. I find myself surrounded by piles of books which often come crashing down, or meaningful postcards (so meaningful that I keep replacing them…) like this painting of Freud in his London study. Gazing at this postcard, a reproduction of a photograph of a painting of an imaginary scene of Freud inspired by an eccentric assemblage of ancient gods which were small ancient-made copies of life-size statues, I cannot but be reminded (as in Plato’s famous allegory) that many of us think and dream through visual prisms. I’d love to meet someone who thinks without “crutches”: however acute my capacity to reason, my thoughts always seem to meander. 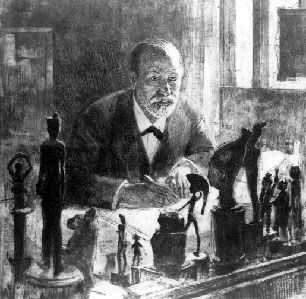 Here’s the great Freud, surrounded by ancient artefacts in order to better concoct theories on Oedipus and his doting mother. Our relationship with the past and the long passed past is beyond words like “complex”: we’re in the realm of inspiration. Needless to say, there is more to ancient vestiges than a romantic love of ruins. Indeed, is it not more poetic (from the Greek poiesis, to “produce”) to re-recreate a past world through the patient reconstruction of ancient ruins? Is it not more fascinating to love what is beyond the ruins, be it an archaeological pursuit of a bygone era, a complex police investigation, or Freud’s tortuous curiosity of the human mind and its unfathomed depths? This postcard also reminds me that my archaeological calling could have had a rather different outcome, a field ‘digger’, lost-out-of-context, or gathering dust in a prestigious museum basement. Instead, I turn my archaeological and psychological insights to writing fiction and I really enjoy it as much as scholarly research (without the footnotes). Thus, returning to my first idea, by writing to you, o ye reader, I hope to crystallise my various strands of thoughts and engage with some of you. It might actually be fun to read at times.